If you’re like the 93% of marketers rating ABM as “important” or “extremely important,” you’re already in the driver’s seat with account-based initiatives. But if you want help putting the pedal to the metal, look no further. This free e-book will help you accelerate your efforts toward increasing closed deals, average deal size, and target account and C-level engagement with efficient, effective account-based marketing. Target accounts primed to be your best potential customers. Build a strategy for sales and marketing collaboration. Tier target account personalization plans. Model an engagement plan and playbook. Measure and modify your results. 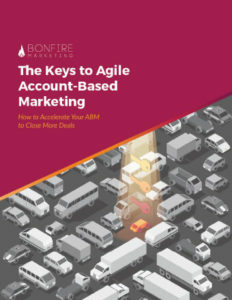 GET YOUR FREE ABM EBOOK! Subscribe to the Bonfire Newsletter (monthly) and occasional marketing news updates by checking the box below.